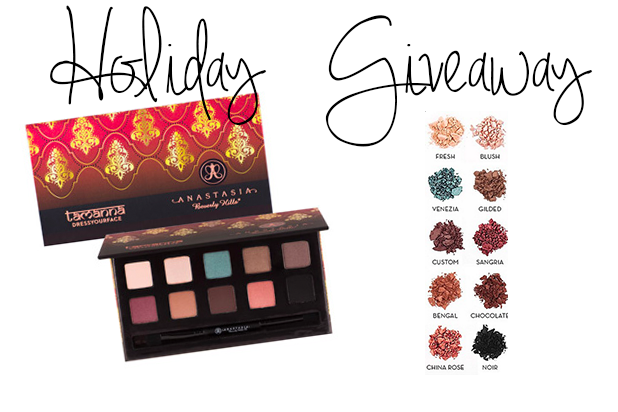 To share my excitement for the Holidays I wanted to do a quick small giveaway. I recently got my hands on The Anastasia Beverly Hills Tamanna Palette. I love it so much that I wanted to give it to one of my readers. 1. You must be subscribed to the blog either thru google + or bloglovin. 2. Must comment bellow what you love about the Holidays? And log in the box bellow. For an extra entry just follow me on instagram and repost image #rocycheeksgiveaway. The Giveaway will end DEC 12th 2014 and is US ONLY. Also decorating with the family brings me a lot of happiness! I love this time of year! I love eggnog, good friends, and good laughs! This is the best time of year to spend with those you love and to make lots of new memories! well said.. Im not a big fan of the eggnog, I love hot peppermint mocha you should try it.. yum!! There are a few things I enjoy about Christmas, one of the most rewarding is taking gifts to the less fortunate and sick children, I started this tradition last year with my LO and I hope I can continue to do this for many more years to come because it really let's you see what Christmas is all about. I also love seeing my LO help decorate (in his own messy way lol) being able to get dressed up and celebrate with the ones who matter most to me.... oh yeah and the FOOD lol. I love the spirit of the holidays. There is just a feeling of joy in the air and you see it all around! There is always something to do and some holiday thing to attend. It's just a fun time! Why do I love the holidays? I think I should narrow this question down to specifics. Why do I love Christmas? Let's just say the answer is found amongst the word itself. Christ. I truly believe that the joy felt during the holidays is a reflection of the joy we ought to feel when we understand the story of that baby who was born on a manger many years ago. It's a story of redemption and a story that reflects amongst all the charitable acts we see around the holiday season. The Christmas story is not about lights and gorgeous Christmas trees that entertain the eye, but rather about the story of redemption of sins that once held us captive. Sure, the lights are AWESOME and sure to capture the attention of us all including FPL, but we must not set aside the story that set us free. The story that once started on a barn with the birth of a very special baby and ended on a cross. The story that allows us to cry to the heavens in moments of desperation and gives us peace through tribulation. This is why I celebrate Christmas and the joy of the holiday season. I celebrate and proclaim Christ's glory and story of love and peace, hope and faith. Matthew 1:18-24 blessings to all! I love how my family gets together for the holidays, we all out our troubles aside and have a good time together. Everyone is happy and not to mention there is food everywhere! I love Christmas the most because of the ugly christmas sweater parties and going in the city to see the lights. Also in the month of december they start putting up these Christmas movies which I love to stay in and watch while eating pizza. When Christmas is over, then you start looking forward to New Year's Eve and it's just wonderful! Spending time with family/friends (if possible) and the fact that everyone seems to be in a more giving and generous mood! Happy Holidays and Thank you doll. This looks so luxurious, thanks for the chance! Everyone is always busy at work so what I love about the holidays is that we can forget about all of that and be together as a family. And now that my nephew was born in December the holidays will be even better. Thank you so much for the giveaway. Spending time with the family, we gave so much to be grateful for, my sister had twin this year, celebrate the birth of baby Jesus. THE FOOD! Happy Holidays! I love seeing people giving selflessly towards strangers and being kind. Let's keep it up! I love the cold weather, peppermint everything and of course the Christmas songs!